adidas is unveiling its first natural running shoe collection with the adipure Motion (for beginners), adipure Gazelle (for intermediate level runners) and the adipure Adapt (for the advance natural runner). 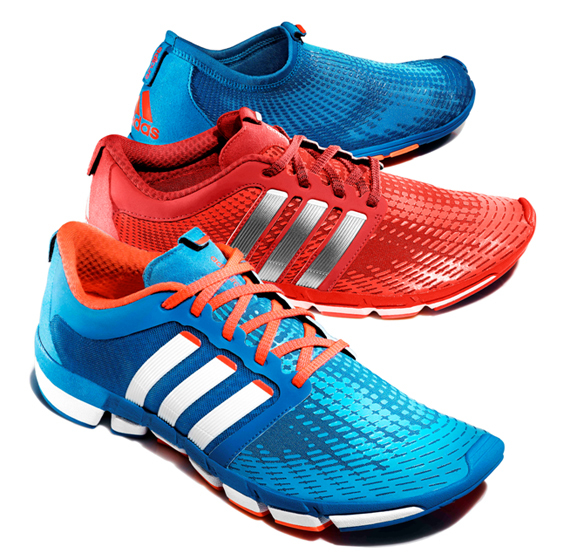 The adipure running range is engineered to promote pure and natural movement to help athletes safely and gradually improve their speed, strength and performance through minimalist running. Maintaining each model’s familiar silhouette, each piece of the collection utilizes a flexible textile upper on the forefoot (what designers are calling a second-skin) with an adidas adipure tooled midsole-outsole construction in place to liberate you to move your feet as freely as if you were barefoot. The sleeve-like Adapt is built to match the shape of your foot with a full-length ADIPRENE+ cushion installed for a smooth ride, while the Gazelle and Motion wear PUREMOTION midsoles that mimic natural stability paired with the durability of the ADIWEAR outsole. All three members of the trio are already available on adidas online store with models also hitting to your favorite local adidas retailer. DC Shoes Special Edition Collection "LONDON PACK"